We are happy to inform you that Voxengo Shinechilla version 1.1 update is now available for download. 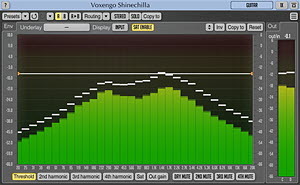 Voxengo Shinechilla is an experimental creative harmonic generator effect for professional sound and music production applications, available in AAX, AudioUnit, VST and VST3 plug-in formats (including native 64-bit support), for macOS, and Windows computers. - Implemented a fast Shift+Click insertion of control points. - Implemented a more flexible way to copy envelopes. - Implemented color scheme editor with load and save functions.